The first effort to organize a civil township out of congressional township 135, range 37, was made on September 3, 1872, when R. L. Frazee presented a petition to the board of commissioners asking for its organization under the name of Frazee. This petition was dated August 31, 1872, and bore the following names: R. L. Frazee, A. G. Matthews, L. C. Nicoud, G. A. Johnson, D. R. Whitney, L. Jewell, Jona Heunkson, Harry Wilber, Andrew Bruteuson, C. W. Erickson, C. Bruteuson, John Christonson, Ole A. Dahl, M. Barg, Charles P. Jewell, Robert Buchanan, Alfred Pressy, A. Heutchinson and G. Sheets. This petition was granted and the township so named, but, according to the commissioners' records, there were "no boundaries defined and no affixed day for the first town meeting." Nothing appears to have been done towards putting the township organization into effect. A second effort was made to organize the territory in question into a civil township the following year. The petition was dated June 16, 1873, and the county commissioners at the regular session, September 1, 1873, granted the prayer of the petitioners and ordered that the aforesaid township be organized and called New York Mills. This petition contained the following names: Charles Townley, George L. Cornwell, A. Cornwell, J. H. McMath, J. McDonald, John Setherland, G. Edwart, Gina Ramsdell, C. R. J ewell, J. A. Johnson, Thomas A. Morrison, Frank F. Saunders, Charles Moffat, Charles Lundgren, John Brown, R. McKinnen, John T. Kerr, Holida Henrickson, Frank Oelson, F. N. Hendrickson, Nathan Colby, Robert Griffin, P. Steinberg, S. A. Moffat, I. Grismer, N. E. Oppigaar, George Filzt, E. N. Hoggy, Blair Beveey, D. Jewell, G. W. Jewell, F. Jewell, G. H. Merwib, T. Springstead and John McKinnen. After the granting of the second petition the organizers of this township seem to have neglected to proceed with their organization. It was four years later, in fact, before a third and final attempt was made to organize the territory in question into a civil township. The actual beginning of Newton township dates from March 22, 1877, at which time it was organized under the name of New York Mills township (township 135, range 37). This last petition was dated March 13, 1877, and bears the following signatures: J. C. Winslow, J. S. Austin, B. H. Winslow, J. Harrigan, Henry Fletcher, Alex Hendrickson, Thomas Rilley, John Welsh, A. Watson, L. Walker, Thomas Ottio, Andrew Poopert, Alex Pekeine, Mats Ronkainen, H. Hawkins , and Charley Townley. The commissioners designated the store of Towsley & Cornwell as a suitable place for holding the first election, and set April 11 for election day. The township continued to bear the cumbersome appellation of New York Mills until July 26, 1883, when it was rechristened by the name which it now bears. It is interesting to note that when J. S. Austin and sixty-four other petitioners asked on this latter day (July 26, 1883,) for a change in the name of the township they requested that it be called Woodland, but the board discovered that there was another township by the same name in the state and accordingly "selected the name of Newton and directed that the township be so named." The tax duplicate of 1870 gives the taxpayers in Newton township as Henry Van Arman, Esther Gillman and Charles A. Giliman. This was seven years before it was organized as a civil township. This township was the thirty-fifth organized in Otter Tail county although it had the opportunity of being the twenty-third, but through the lack of interest on the part of the citizens they failed to take advantage of the first act organizing the township. Consequently, twelve other townships took on a civil organization from the time the first petition for the organization of Newton was granted until it actually became an organized township. This township is bounded on the north by Homestead, on the west by Otto, on the south by Deer Creek and on the east by Bluffton. Newton bears a unique distinction, along with a very few of the other townships on the eastern side, of having not a single lake within its limits. The natural drainage of this township is excellent. The southern and eastern part of the township is drained by a tributary of Leaf river. This small creek rises in section 10 and meanders east and south, leaving the township from section14. The north and eastern side is drained through Bluff creek, one branch of which rises in section15, while the main stream enters from Homestead township and takes a southward course, leaving Newton township in the northeastern corner of section25. These streams afford excellent natural and artificial drainage for the farms in this section. This township is densely populated and the farms range in size from forty to one hundred acres, but the greater percentage contain forty and eighty acres. The farms are all under good cultivation while the farming is carried on with all the advanced methods and improved implements. The main line of the Northern Pacific railroad passes through this township, running almost diagonally from northwest to southeast. This road was completed in 1871 and accounts for the early and rapid settlement of this township. There are two stations on this line in Newton, namely, New York Mills and Dopelius. Boardman was the first village platted in Newton township. This was located on the Northern Pacific railroad in section 7, but as New York Mills was laid out only one-half mile from the former and eventually enveloped this town, it lost its identity and became a part of New York Mills. Boardman was platted for Alexander Watson, Henry T. Turner and John Harrigan by T. W. Jones. It was recorded in the office of register of deeds February 16, 1880. The village of New York Mills, located in section 8, was platted by E. W. Jones for the following proprietors. : Henry and Anna Van Aernan, O. P. and Marshia Boardman, S. D. and A. P. Brown (his wife) and George L. and Ada Cornwell. 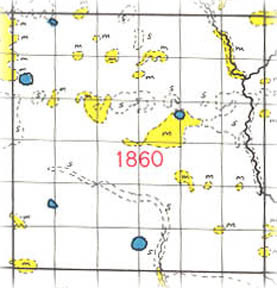 The plat of the village was recorded on October 12, 1883. A petition for incorporation, dated January 7, 1884, was prepared pursuant to chapter 17 of the General Laws of 1883, and signed by the following legal voters of the proposed incorporation: C. H. Yates, A. Caniff, E. F. Yates, Charles J. Johnson, O. Parry, Fred Reynolds, O. A. Austin, M. Henrikson, August Sitz, Ferdnand Stolz, W. H. Norton, John D. Campbell, B. P. Duffin, A. H. Norton, F. H. Stull, C. E. Kimberlin, A. McNally, A. P. Hahn, C. W. Fiske, F. Dixon, C. W. Reynolds, A. O. Sherman, W. C. Bickel, J. W. Kinney, Levi Stevens, A. W. Taylor, C. H. Gilman, William L. Taylor, H. Maratz, H. W. Nunn, Alexander Watson, A. S. Blowers and Levi Walker. An interesting statement in the petition refers to the reasons why the incorporation is sought. "The social as well as the business; interests of said territory will be greatly benefited by a municipal form of government as the said town * * * (is) situated on the Northern Pacific railroad * * * and is a supply station for large numbers of railroad men and lumbermen." The petition states that the village has a population of "Three Hundred Souls." This population was scattered over an area of twelve hundred and eighty acres. This petition was presented to the judge of the district court, S. W. Collins, and on May 27, 1884, he granted the request of the petitioners. The judge appointed John Megguis, A. P. Helm and O. A. Austin as judges of the first election for village officials. New York Mills now has a population of five hundred. The town has grown and extended in the last few years and several modern buildings, both business and residential, have made it a village of prosperous appearance. The fire engine house was completed in 1914. This department is entirely volunteer. The equipment consists of a hose cart, gasoline engine, chemical engine, and a thousand feet of hose. The water is pumped from the railroad tank, although there is a storage cistern under the fire house for use in case of emergencies. New York Mills has an excellent band of sixteen pieces. Andrew Lind is the present postmaster and H. A. Hanser railroad agent. Ethel Hopp is superintendent of the pump station for the railroad. There are three churches in this village: two Finnish churches and one Congregational. The Modern Woodmen, Modern Brotherhood of America and Royal, Neighbor lodges all have chapters here. This village draws from quite an extensive farming area, but this is less on account of Perham and the other towns along the Northern Pacific railroad. The present business and professional interests of the town follow: Elevators, Farmers Elevator Co., and Andrews & Gage; barbers, Adolph Smith; blacksmiths, D. F. Carmichael, John Borden; bottling works, W. F. Muckalah; creamery, New York Mills Creamery Company; druggists, W. A. Miller; feed mill, T. H. Allars; garage, Atkinson & Stiner, and Mershu & Wapla; general store, M. R. Denison, C. A. Matla, Farmers Cooperative Co.; grocery, Victor Komulainen, Herman Hananen; hardware, Mershu & Wapola, Lind & Piilola; hotel, Merchants Hotel; livery, Fiske Bros., William Peters; lumber, Dower Lumber Co.; meat market, Charles Peckla; pool hall, William Peters; veterinary, H. T. Fiske; picture shows, S. C. Olson. The present village officers are as follow: President, C. R. Stinar; trustees, A. O. Mattson, W. F. Wood and Andrew Piilola; clerk, John H. Mursu; treasurer, E. R. Rosser; assessor, J. A. Muckala; justices, E. O. Quallom and. R. A. Williams; constable's,: Matt Ruikka and William Stinar. The village of Dopelius the only other in Newton township, was recorded August 6, 1901, for Clifford W. and Bertha M. Baumhach (his wife) by Martin Aalberg. A postoffice was originally located in this township in section 25 by the name of Amboy, but this was taken over by Dopelius when the latter was platted. Places of birth for Newton Township in the 1905 state census.